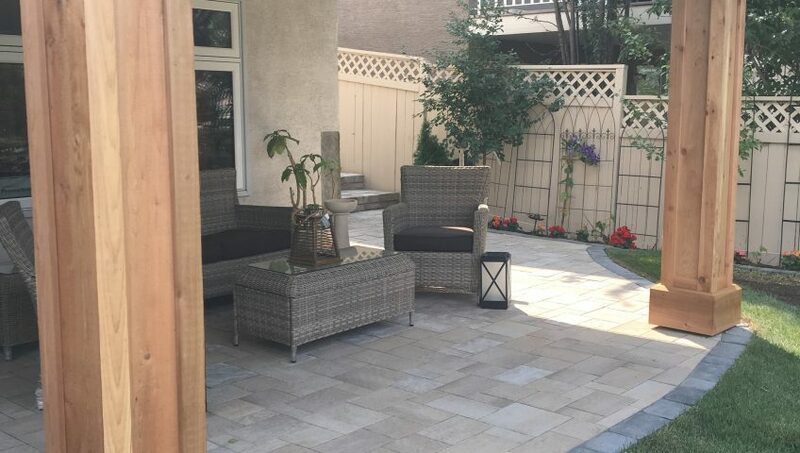 Wood features are a great way to soften the look of your landscaping. Arbors and Pergolas can give you that soft touch and arbors and pergolas for your front or back yard can be a practical landscaping feature too. Whats the difference between an Arbor and Pergola? Some of our Calgary clients are confused by the difference between an arbor and a pergola. The differences are quite clear really. An arbor is typically much smaller than a pergola. An arbor is often used for a garden accent or as an archway over your front or backyard entrance. 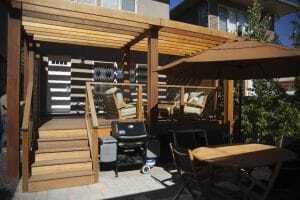 A pergola is normally used over top of a patio or siting area to provide shade and/or privacy. A pergola normally has numerous large cross beams whereas an arbor may only have a two or three. Read more about arbors and pergolas for your front or back yard. Pergolas for shade are quite common in Calgary. They are very useful in blocking much of the sunlight that shines onto your patio or sitting area. You can choose to have a greenhouse like fibreglass roof on your pergola to keep out the rain and reduce sunlight or you can leave the roof open for partial shade from the cross beams. Pergolas being used for privacy is another common application. Often we find that neighbouring homes have high decks that overlook our clients properties so in this case a pergola can provide excellent privacy over top of your patio or hot tub area. 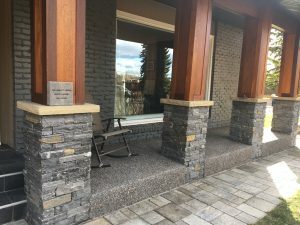 Did you know that arbors can be a great aid for drainage solutions? We often use cedar arbors to straddle a front or back walkway. Instead of running your drain pipe underground you can choose to run your drain pipe over top of the arbor and therefore over top the walkway and down the other side of the arbor. This allows you to avoid underground drainage. Overland drainage is always preferred over underground drainage because underground drainage can freeze up in spring and cause your eavestrough to over flow. We can hide the drain pipe in the arbor beams so they are not visible. You can visit our page on drainage solutions to learn more about using arbors for drainage issues. Arbors make beautiful landscape accents. The warm look of cedar can help to soften your landscape while providing an ornate accent to your property. We can build arbors in a variety of styles and they can be stained or painted according to what matches your landscape best. The soft look of cedar arbors is particularly helpful when you have a lot of concrete or cold landscape components. Arbors and pergolas are almost always built out of either cedar, Meranti hardwood or pressure treated wood. If you want a rich wood look for your arbor then cedar or meranti is best. If you plan on painting your arbor then pressure treated wood be appropriate and is also the least expensive option. Using arbors or pergolas for your front or back yard are is a great idea regardless of what material you use.